Every year, HUB Young Life hosts a Golf Classic to raise money for their young adult outreach program. 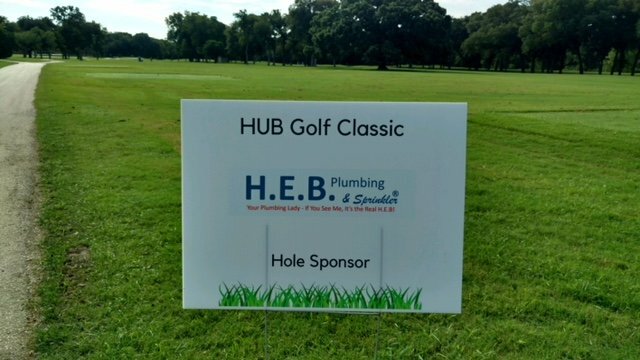 This year, HEB Plumbing & Sprinkler was proud to sponsor one of the holes on the course in support of the program. Young Life is an organization that reaches out to youths in several areas around the country. One of their main bases of operation is right here in the Mid-Cities (Hurst-Euless-Bedford) area. The organization attends events at LD Bell, Birdville ISD, Trinity, Covenant Christian Academy, and other schools. Through attending these events, they’re able to meet with youths and help them better their lives. But this non-profit organization can’t do their work without support. Every year, they host the HUB Young Life Golf Classic to raise money for their organization. This year, the event was held at the Diamond Oaks Country Club. The attendees received breakfast, lunch, and awards for their great golfing skills. Kathlyn Smith was a member of Young Life as a young adult, and she was proud to be able to give back to an organization that was so important to her. HEB sponsored a hole on the course, thus helping to make the event happen. Young Life is always looking for volunteers to help out with outreaches and events. They are also grateful for any donations that people are willing to give to help out their organizations. And when the 2019 HUB Young Life Golf Classic comes around, you can also lend your support by sponsoring a hole or attending the event with friends. Kathlyn Smith’s desire to help out her community is why she started HEB Plumbing & Sprinkler. If you’re ever in need of a plumber you can trust, call her up and she’ll be on her way to help as quickly as possible.